We are getting ready for the ‘ That’s My Style ‘ Vintage Clothing Sale being held in conjunction with the Fiberfest show at the Almonte Arena being held on Sept. 12th and 13th 2015. Almonte is just 30 minutes west of the city of Ottawa Ontario. 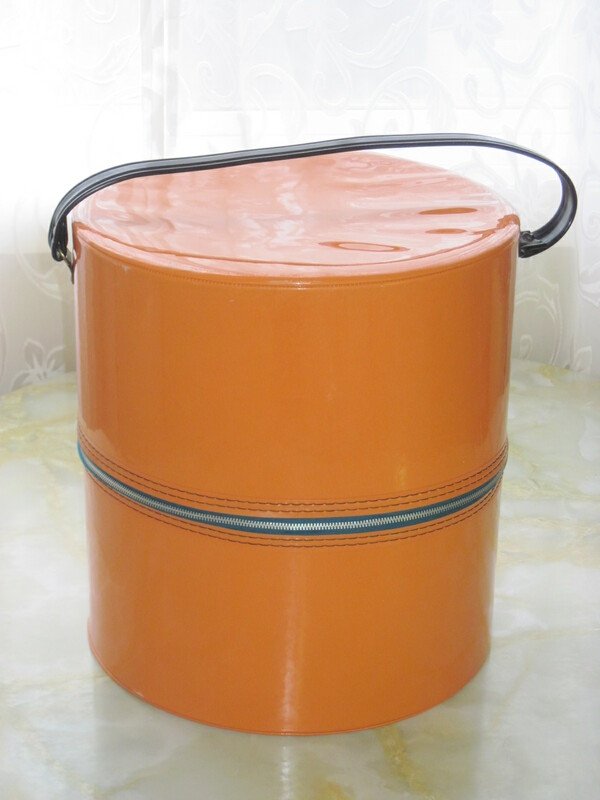 I will be bringing vintage accessories like hats, purses, gloves, and the orange vinyl hat carrier shown in the photo. I also have a wide assortment of vintage buttons and some nice pieces of jewellery, vintage linens, furs and lots more. There will be tons of items to browse through. Mark the date on your calendar and check back to my blog for more photos of vintage items that will be for sale at the show. Below is the online site address for the Mississippi Valley Textile Museum which is hosting the show. Read about all the fiber arts that will be at the show as well. 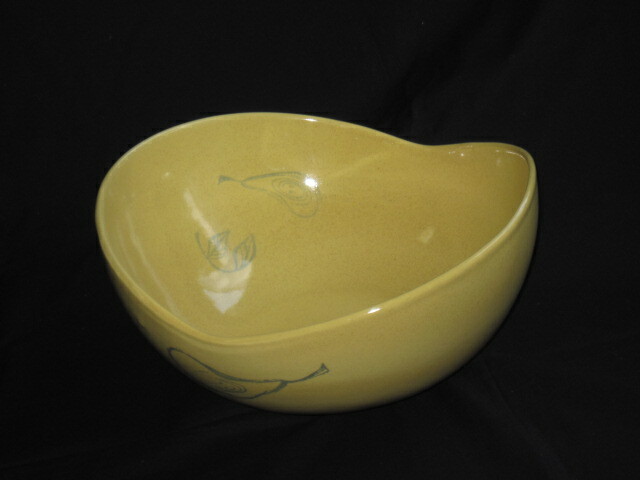 Dishes made by Staffordshire England, Chef Ware. Pattern is Cordon Bleu. One plate has a chip on the edge. The others are all in nice, shiny condition. 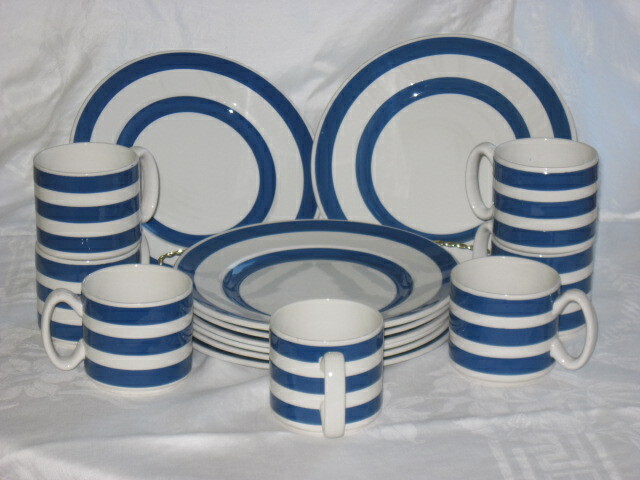 There are 8 dinner plates and 7 mugs. 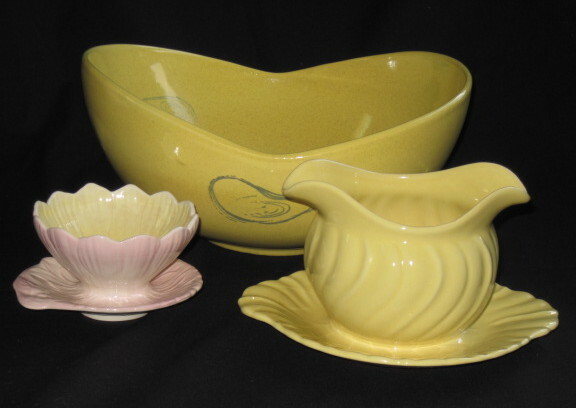 These dishes date to the middle of the twentieth century. Available only in my booth ‘Fab Finds’ at the Almonte Antique Market, 26 Mill Street, Almonte ON. The market is in a 2 storey heritage building and houses over 55 different vendors. Open year round from 10am to 5pm with plenty of free parking at the rear of the building. Please note that four plates and four mugs are SOLD!! 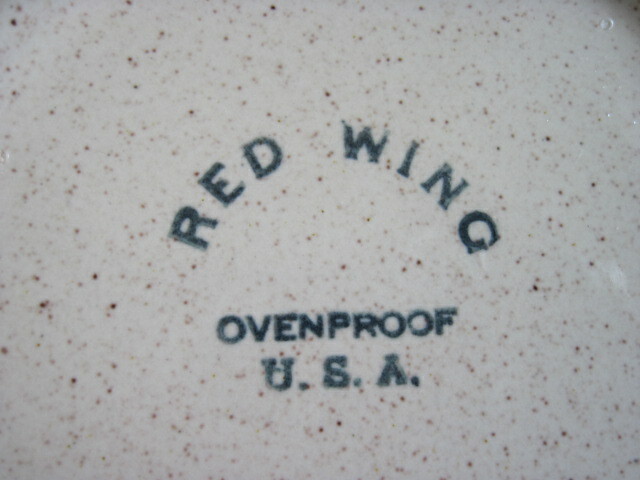 You can read about the history of Red Wing Pottery at their online site http://www.redwingpottery.com/our-history/our-history. 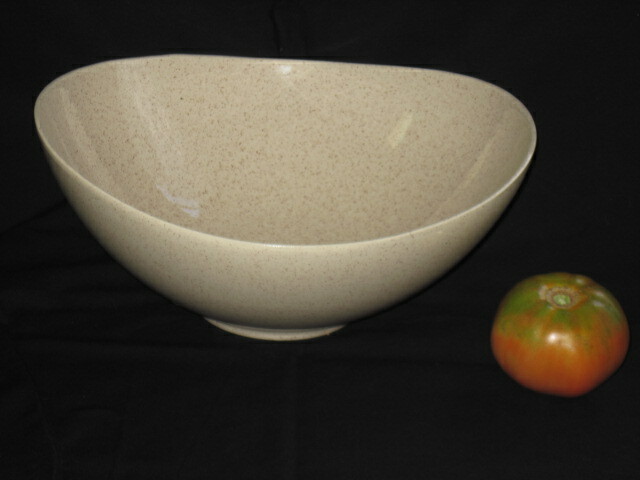 This speckled serving bowl is fairly large as you can see by the size of the tomato beside it. Nice mid century modern style would suggest it is dated from the 1950’s. In very good overall condition showing little wear on the inside. Quite versatile piece as it is ovenproof. Nice bowl to warm up the dinner rolls in for supper. This will be available at my booth at the Ottawa Antique and Vintage Market to be held at The Fieldhouse at Carleton University, Bronson Ave. & Sunnyside Ave. Ottawa Ontario, on October 17th and 18th, 2015. I will be bringing many of my mid century modern dishes and glassware, kitchen ware, teak bowls, maple salad bowls by Baribocraft, and Danish modern glassware by Iittala. Look for the booth ‘Fab Finds’. This bowl will be priced at $45. Pretty hard to find these pieces by Phaltzgraff. The pattern is called Country Time and it was designed by Ben Siebel for Phaltzgraff in 1952. This one is quite large and would hold a good sized salad. The pattern on the sides looks like a stylized flower or vegetable. The colour is Saffron and it is speckled with a darker colour. 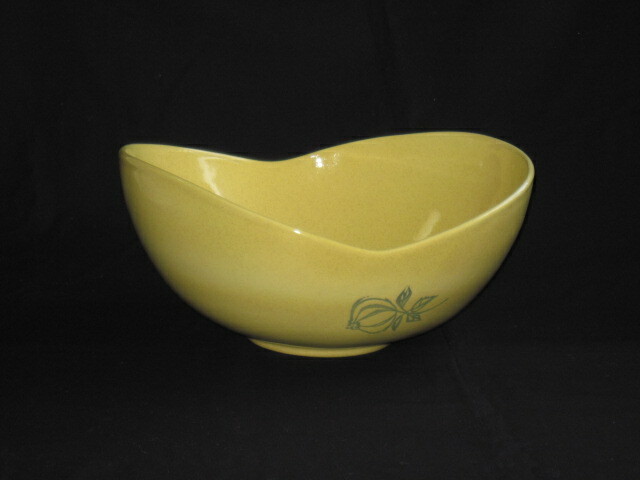 Very mid century modern looking dish. The pattern on the inside appears faded but the glaze is still shiny so I am not sure if the pattern was supposed to be a light contrast or not. The pattern on other pieces I have seen on ebay appear to be darker. Could just be from a different lot or could be from use although the inside of the bowl does not appear to be scratched nor showing signs of wear. Second photo shows size comparison to other items. Available for sale at my booth at the Almonte Antique Market, 26 Mill Street, Almonte ON. Open daily, 10am to 5pm, year round, only closed on Christmas day. Plenty of free parking behind the store. Nice old heritage building with 5000 square feet which houses 55 vendors currently.